I see you in lilac. Which monkey are you missing? Email me if you'd like about it. I have not changed any links. Ever. No, Brandi for what ever reason .. I lost my monkey, when I posted the last few times, I had no avatar at all. Yet I never removed my Monkey you made me. I had to go back today and re-add your link you made me. I don't know what happened. Because I never removed your http link that you created. I think something happened in the upgrade? Brandi, was strange bec the last few times I have logged in - I had no Avatar what so ever at the top of my login page. And when I did post I had no Avatar showing .. and I thought hmmm. Must have been an error in code ? It's possible it had something to do with the server upgrade. Looks like you are back in business now. She may or not like it - I think its a cool " Clay Cat" ..... her's is a fairly new Monkey. I just made this for her from her most recent one. Lemme see what I can do with theone you posted. Thank you! 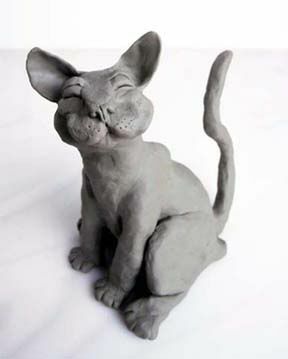 I love the kitty made out of clay! I don't think I can use the evil smiling cat, because it's an original belonging to someone else. It's neat how you made the eyes blink, though, Brandi! I'll see what I can do with the clay cat, claycat. OMG I had when I was a little girl - Zip the Monkey ..but he didn't looka like that Zip .. He looka like this, I took him everywhere I went, Omg, I can still smell him and feel him, he was filled with those itty bitty tiny Styrofoam balls/like BB's inside.. and I chewed his banana, or gummed it to death before I had teef ...his banana was 1/2 missing - I so loved him. Good Times being a little one. He survived me until I was about 10yrs old - and we had moved several times.. he was lost in a flood .. I miss him. I found this pic of him on Ebay. I came up with these two. Not sure what you were looking for though. Hi Brandi, could you possibly do me an avitar with an orangutan? Sure. Let me work on that for you. It may be sometime tomorrow before I will have some ready for you. OOO I love the eyes .. is it possible - Maybe a silver(any color) collar with a glowing gem pendant. Brandi ( we write to you as if you are the Sear's Christmas Catalog and expect our wish lists to be granted. You always make the best Avatars- CBB does Too - not to leave her out. Here I am making a avatar for Claycat - it's her choice .. just me thinking of her .. she needs a some glisten to her Clay Earthy Kitty Cat. How about a diamond necklace? Page created in 6.185 seconds with 19 queries.